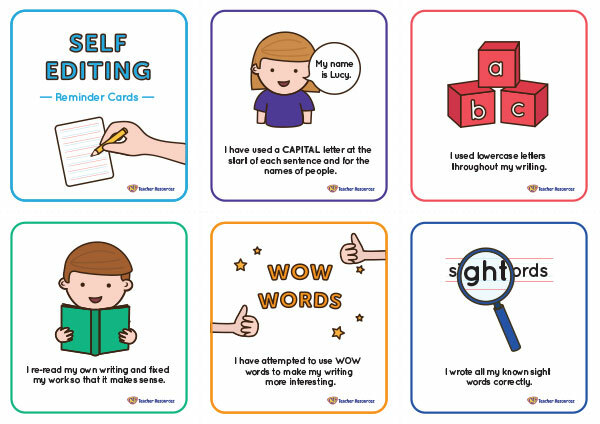 A set of 10 self-editing reminder cards to help children with their writing. Ideal to display and use in the classroom during independent writing tasks. Children refer to the cards when editing their own work. Print, cut then laminate each card. Punch a hole in the top left-hand corner of each card and attach with a key ring. Provide each child with their own set to refer to when writing. Alternatively, enlarge the cards and display in the classroom as part of your writing corner. After writing, encourage the children to refer to the cards and self-edit their own work. What comes next? – Use the cards as a whole class when editing jointly constructed pieces of writing. Thank you. I love these and will use for writing goals. Love these but is it possible to download them in the NSW font? You can now download the Self Editing Reminder Cards in each of the school fonts.